In this post: How to freeze zucchini the easy way! 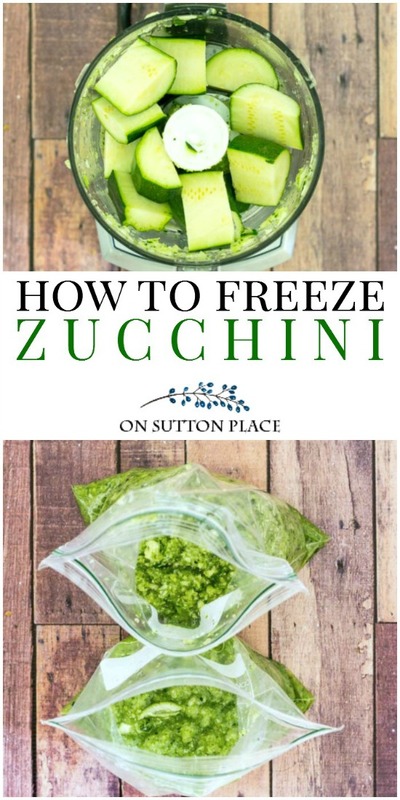 Step by step directions for freezing zucchini to use in cookies, cakes & breads. It’s that time of year. Even though summer is definitely still here, I have to admit I’m thinking about fall. I’m not ready for it…just thinking about it. One of my favorite things to do when the cooler days appear is retreat to my kitchen and bake. Fall recipes mean comfort food. Comfort food means homemade bread fresh from the oven. One of my favorite quick bread recipes is zucchini bread…but you have to take care of freezing zucchini while it’s available from the garden or farmers market. Soooo…here I am with a quick tutorial on how to freeze zucchini. Grab yourself a few regular sized zucchini. (Or they can be the giant ones that come straight from the garden.) I got mine at our local market because I’m not a vegetable gardener. I got four zucchini this time around. Two medium zucchini will chop up to equal about two cups. That’s your go-to amount for most recipes (more or less.) 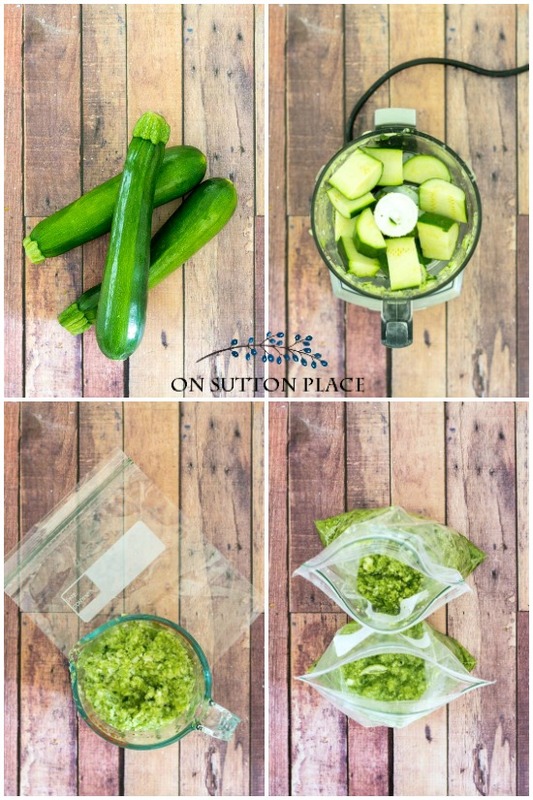 Chunk the zucchini into small pieces and shred in a food processor. As I’m shredding, I dump the zucchini into a 2 cup measurer. When I hit the 2-cup mark, the zucchini goes into a resealable bag. My four zucchini shredded to equal 4 cups. Back in the day, I used to shred my zucchini with a hand grater. It wasn’t hard but it took some time. A food processor is easier but if you don’t have one, a regular old grater will work. The bagged, shredded zucchini lasts in the freezer for up to three months. I have kept it longer and still used it…and it was fine. I wouldn’t keep it for longer than six months. Freezing zucchini noodles: Spiralize your zucchini. Place the noodles in a colander and sprinkle with kosher salt. Lightly toss the noodles and let them drain in the colander for 30 minutes. Place the noodles in resealable bags. This tip is from a reader: Make up the zucchini bread batter, put it in freezer bags and freeze flat. Stores easily and fresh bread is just a thaw away. I used to make Zucchini Bread frequently when my children were young but haven’t made it in several years. 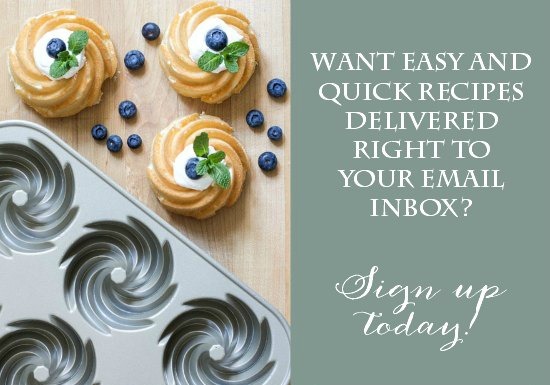 These recipes are great and have rekindled my enthusiasm to get busy in my kitchen! I’m going to try the Bundt Cake first! Loved the cornbread corn casserole recipe too!! Thank you Ann! I have a zuchine bread that I have Made since 1976 and I put put 1/4 tsp of ground cloves in with flour I also put 1 cup walnuts. It is really diff. and very good. Try it! Hi Laura! I do sometimes add walnuts too. My daughter prefers it without though! Great tip Ann! I think zucchini breads are perfect all year! I make up my zucchini bread batter put it in freezer bags and freeze flat. Store easily and fresh bread is just a thaw away. This is an incredible tip. Thank you! What do you do with the zucchini after you shred it?? Just throw the bags in the freezer. When you are ready to bake just thaw it out a few hours before! This is a great tip for making use of that extra zucchini that comes our way in the summer. I freeze mine in 2 cup measures too, and then thaw it before adding to a zucchini bread recipe. And shredded zucchini can also be added to spaghetti sauce, or drained and made into a quiche with some sauteed onions…yum! I love your blog, Ann – you include so many different things! Adding to spaghetti sauce is brilliant. Thanks for the tip! I freeze mine too, there’s nothing better than zucchini bread warm from the oven. I shred mine with my kitchen aid attachment. I’m not sure I would even bother if I had to do it by hand. Thanks so much for sharing this tutorial! 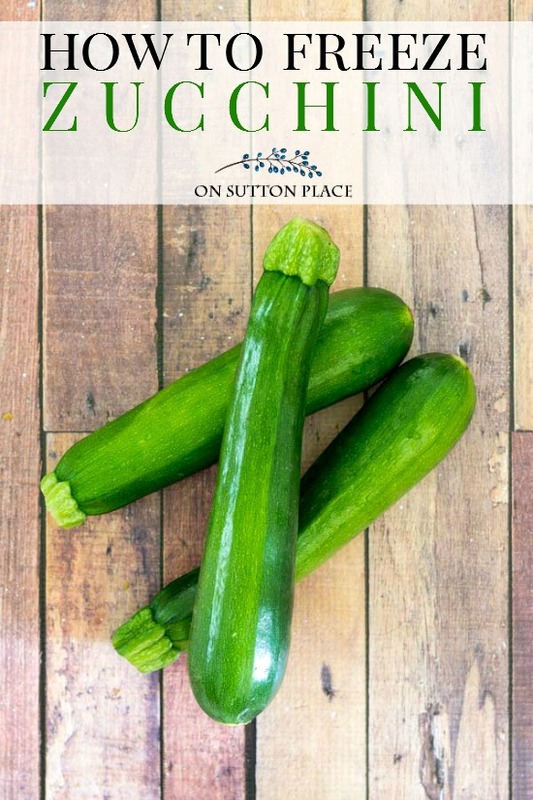 We have enjoyed lots of recipes with zucchini in them this summer, but I am so glad that I will now be able to bake with it in the off season this fall too! Thanks again! Love your blog!!! Sounds good! I love the Fall weather but it can wait awhile. At the moment I’m enjoying Summer. What a great idea… I love fall and I am ready for it! These hot summer days are for the birds! We don’t plant zucchini, but last year a friend gave us some and I made zucchini bread with chocolate chips. This year, I plan to bake lemon zucchini bread with a glaze which I found on Pinterest. Thank you for your tips and tricks. So…that’s it? Just grate, ziplock, and freeze? For soups, sauces, I’ll just toss in frozen, but for baked goods? Should I defrost first and then blot some of the excess moisture? And what’s the best way to defrost? Room temp or overnight in fridge? Thanks! Yep…just grate, bag and freeze. When I want to bake with it I remove from the freezer a few hours before. Actually in the refrig overnight would work just as well. I don’t usually drain or blot any extra moisture. I dump the contents of the bag right into my batter. Draining it though would be fine I’m sure. Your batter might be a bit thicker but that might be good! This is great and your zucchini is pretty. I grew a different kind this year and I don’t like it as much because the skin is harder than I prefer. Most of it is headed to the freezer later today as I like to add it to sauce and soup in the winter. Great post! Well, I do have an abundance so I will be freezer some of mine for fall bread too! Thanks for the tip Ann.